18 September 2013 – One stamp, Two Stunners!!! I am loving the all the Christmas stamps in the Seasonal Catalogue!! There are lots of great new kits to make sending your Christmas cards easy. 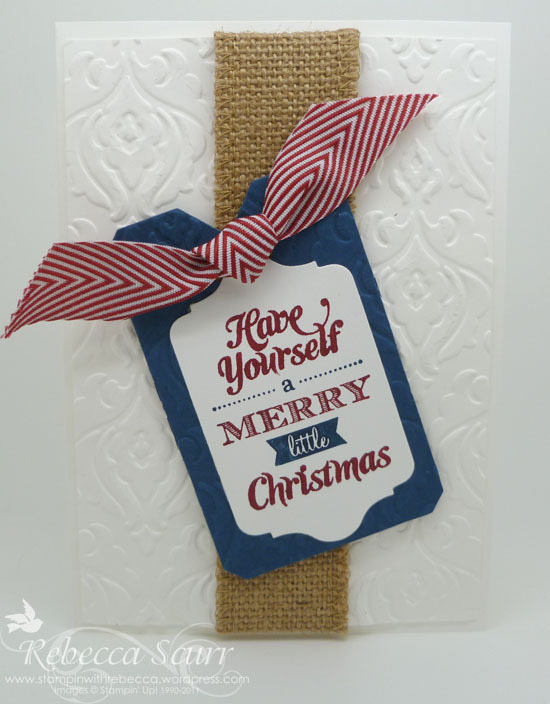 I really like the Merry Little Christmas Simply Created Card kit. It includes just about everything you need to make 8 gorgeous cards to impress your friends with. It has cardstock cards, envelopes, envelope liners, die-cut designer series paper and cardstock accents, buttons and baker’s twine. All you need to add is the matching stamp set, Merry Little Christmas, and ink. We did these at Stamp Club last week and the girls were impressed at how easy it was to put together. I also wanted to showcase another card using the same stamp set. I found this card on Pinterest by Kerry Bray. I love the different textures on it. Please leave me a comment and tell me what’s your favourite part of the Seasonal Catalogue. « 29 August 2013 – It’s soooo exciting!! !